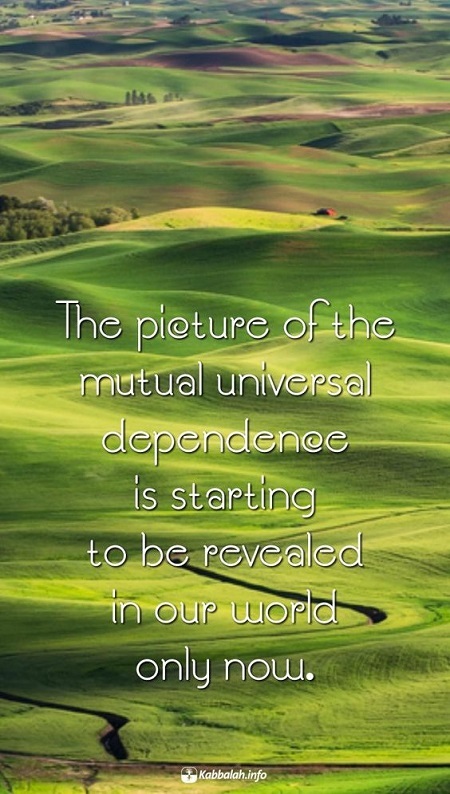 The picture of the mutual universal dependence is starting to be revealed in our world only now. Currently, humanity has reached a new stage of development and now must work together to correct the world. There is no alternative because the current troubles are caused by the revealed Light that urges us to start to unite. Otherwise, it will still continue to move closer to us, but in catastrophic ways. The Light is really getting closer and day by day we are confronted with the consequences of it. Jobs are cut, diseases and problems multiply, the perversions of human nature are growing, mutations; in other words, serious changes for the worse are taking place in human society and the surrounding world.